Flow cytometric analysis of Jurkat (blue) and THP-1 (green) cells using C/EBPα (D56F10) XP® Rabbit mAb (PE Conjugate) (solid lines) or concentration-matched Rabbit (DA1E) mAb IgG XP® Isotype Control (PE Conjugate) #5742 (dashed lines). 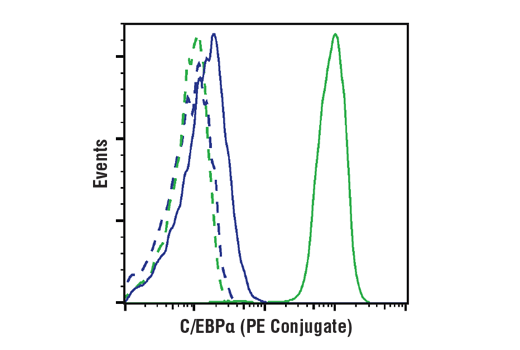 C/EBPα (D56F10) XP® Rabbit mAb (PE Conjugate) recognizes endogenous levels of total C/EBPα protein. Monoclonal antibody is produced by immunizing animals with a synthetic peptide corresponding to residues surrounding Ala176 of human C/EBPα protein. This Cell Signaling Technology antibody is conjugated to phycoerythrin (PE) and tested in-house for direct flow cytometry analysis in human cells. The antibody is expected to exhibit the same species cross-reactivity as the unconjugated C/EBPα (D56F10) XP® Rabbit mAb #8178. CCAAT/enhancer-binding proteins (C/EBPs) are a family of transcription factors that are critical for cellular differentiation, terminal function, and inflammatory response (1). Six members of the family have been characterized (C/EBPα, β, δ, γ, ε, and ζ) and are distributed in a variety of tissues (1). Translation from alternative start codons results in two isoforms of C/EBPα (p42 and p30), which are both strong transcriptional activators (2). It has been reported that insulin and insulin-like growth factor-I stimulate the dephosphorylation of C/EBPα, which may play a key role in insulin-induced repression of GLUT4 transcription (3). Phosphorylation of C/EBPα at Thr222, Thr226, and Ser230 by GSK-3 seems to be required for adipogenesis (4). Lin, F.T. et al. (1993) Proc Natl Acad Sci U S A 90, 9606-10. Hemati, N. et al. (1997) J Biol Chem 272, 25913-9.